Starring Craig T. Nelson, Holly Hunter, Sarah Vowell, Spencer Fox, Samuel L. Jackson, Jason Lee, Elizabeth PeÃ±a and Brad Bird. Brad Bird’s first feature film, The Iron Giant, was a tiny masterpiece that, despite almost universal critical acclaim, slipped in and out of theaters with almost no audience whatsoever. (The film made back only half of its $50 million budget.) 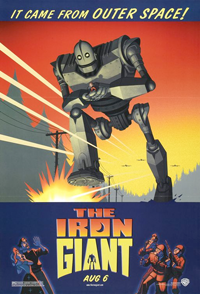 Loosely based on Ted Hughes’ 1968 children’s book, The Iron Man, the less-suable-by-Marvel-Comics Iron Giant is the story of Hogarth Hughes (Eli Marienthal) and his giant, monosyllabic robot (a perfectly typecast Vin Diesel) from outer space, set during the Russophobic 1950s. Sent to investigate what is initially believed to be a meteorite landing, Kent Mansley (Happy Gilmore‘s Christopher McDonald) quickly learns that something else is wandering out in the woods near the Hughes’ home. Once Mansley finds his proof, General Rogard (Frasier‘s John Mahoney) comes in to destroy the giant at all costs. At turns hilarious, poignant and thrilling, The Iron Giant gets a bit heavy-handed with its anti-gun message, but not so much so that those of us without racks on our pick-ups would be turned off.